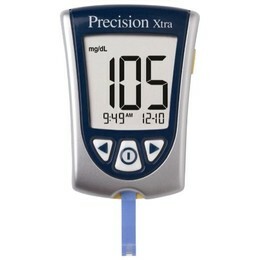 The Precision Xtra Blood Glucose & Ketone Monitoring System was designed for easy testing. Intuitive setup and simple icon-driven menus help simplify blood glucose monitoring. In addition, the Precision Xtra system tests both blood glucose and blood ketone all with the same meter — using the Precision Xtra blood glucose test strips and Precision Xtra blood ketone test strips. Precision Xtra Test Strips—Test Blood Glucose and Blood Ketone with the Same Meter!